I’m obsessed with DIY dinners. You know the kind: your friend invites you over for a nice sit-down dinner. You’re expecting something plated, maybe a fancy pasta or a steak. Then they whip out the grill and all of a sudden you’re doing Korean BBQ. Or maybe they have a takoyaki maker and everyone around you is expertly making perfect ball-shaped food. I am totally that friend. If you’re invited to dinner at my place, there’s a good chance you’ll be making (or at least assembling) your own food. Tacos are a perfect example. I’ll make up a big batch of taco insides: al pastor, carne asada or banh mi fillings and everyone can just go to town. I find the classics are always popular, but a bit of an Asian twist works too. Here, I fried up a simple caramelized pork. The salty-sweet meat goes perfectly with pineapples, cucumbers and cilantro. Super-yum! The only issue I have with DIY taco parties is the tortillas. Warmed tortillas are an absolute must, but when friends are over you don’t want to be the one stuck at the stove warming up tortilla after tortilla. But, I think I’ve solved the problem. Recently, at the grocery store, I saw a microwave tortilla warmer. It kind of looks like a tortilla sleeping bag. I haven’t tried it yet, but it has a delightful donkey piñata pattern and I’m excited to see if microwaved tortillas come close to the ones warmed in a cast iron skillet. I do like the charring you get when you heat up tortillas on the stove, but the convenience of the microwave just might win this particular fight. 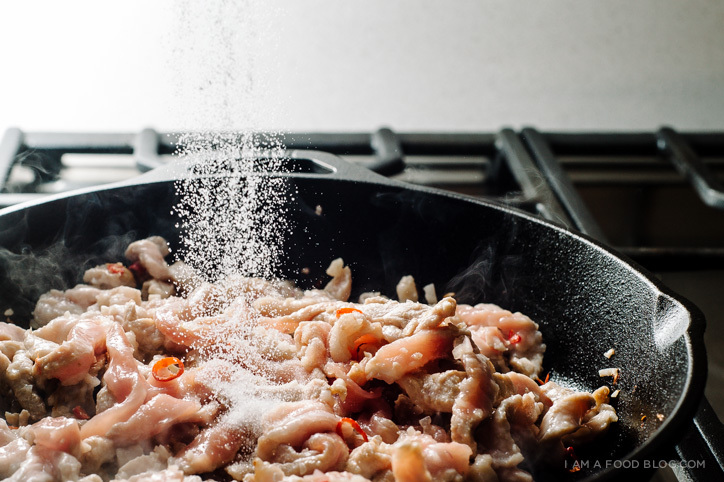 In a bowl, mix together the sliced pork, shallot, garlic. sliced Thai chili, and fish sauce. In a separate bowl, mix together the pineapple, cucumbers, green onions, and lime juice. Season with salt and freshly ground pepper to taste. Set aside. In a small bowl, mix together the diced onion and chopped cilantro. Set aside. Heat up a cast iron pan over medium-high heat and add a touch of oil to the pan. 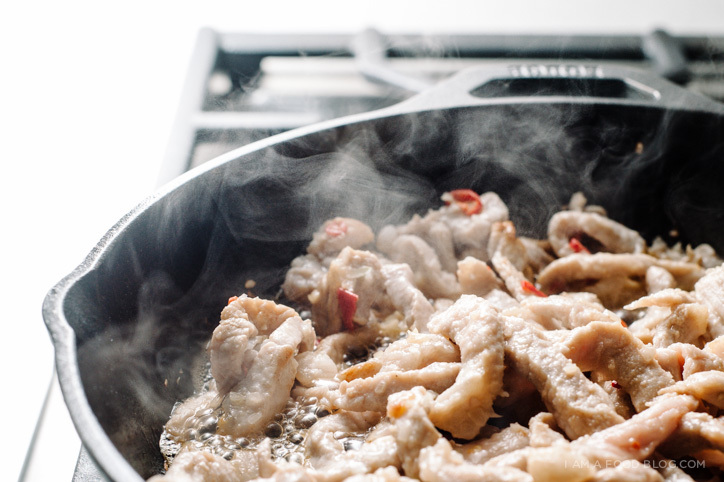 Cook the pork, moving in the pan occasionally, until it turns from pink until white, 1-2 minutes. Add the sugar and water, stir and cook until the sugar caramelizes and turns golden brown, another 2-3 minutes. Remove from the pan and set aside. Serve with warmed tortillas, the pineapple salsa, cilantro-onion mix and lime wedges. Enjoy! PS – If you like this recipe, preorder my cookbook, Easy Gourmet, today! It’s super on sale right now (37% off!) and it has one of my favourite taco recipes in it! I usually just put all of the tortillas flat on a baking sheet and pop them in the oven for a few minutes. A little crisp and warmed! Awesome! These look great, Steph. I can imagine that dinners at your place are quite the delicious experience! I’m going to look in to this tortilla-warmer situation! :) i’ll let you know how the tortilla warmer works out! maybe one day we’ll eat together! Nom! 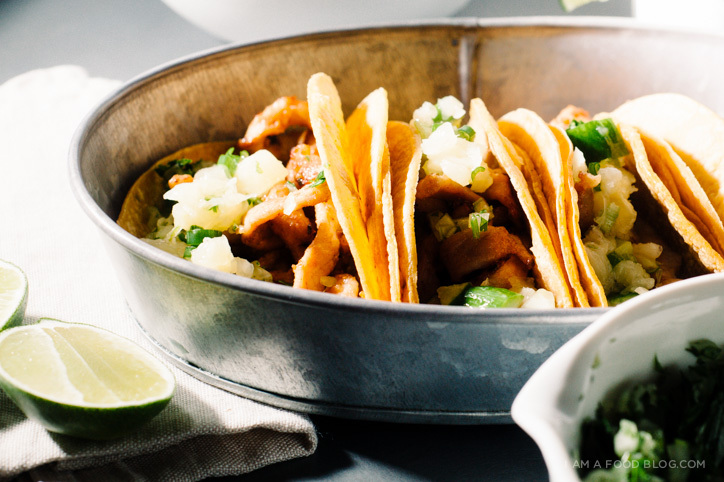 Caramelized pork in tacos sounds absolutely delish. Also, I love interactive dinner parties so feel free to invite me over to your place any time, ehem. michelle – you’re ALWAYS invited! 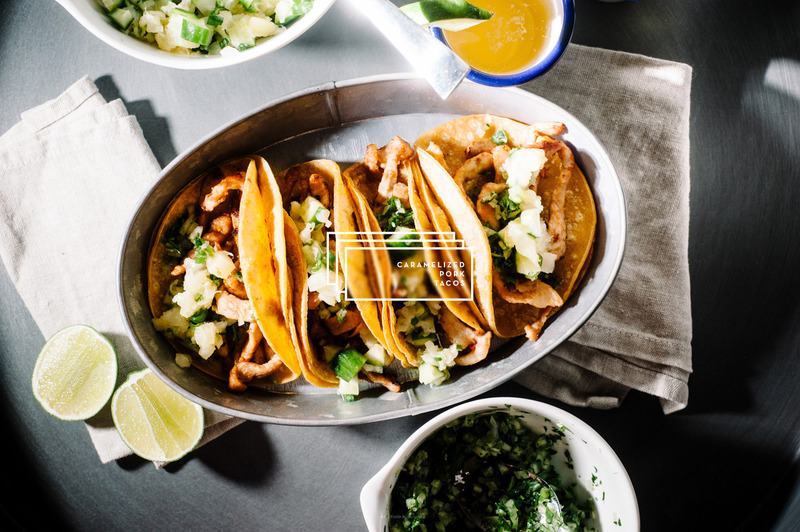 I’m so with you – I love tacos for a party (and that microwave tortilla warmer sounds genius). It just seems so much more fun when everyone’s getting down and dirty and piling their plates high with all the fixings. yes, yes, YES! down and dirty is where it’s AT! Mmm this looks amazing! I love tacos, so I’d be down with a DIY-taco night. That tortilla warmer sounds pretty sweet. i’m excited to try it out! I assume you include the fish sauce with the pork, garlic, shallot and pepper? i’ll see you at 7 mmkay? :) please come visit me!!!!! umm yumm. Putting these on the dinner list for next week! 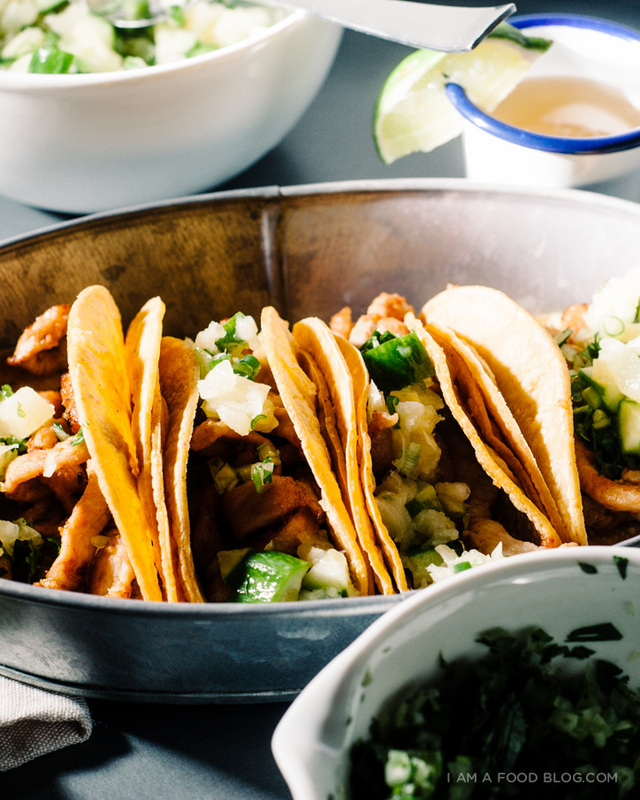 I love the idea of having friends over and everyone put together their own tacos. I’ll have to keep that in mind for when we have guests over next. When making several tortillas, we’ve put them in the oven for a few minutes on a baking sheet to warm them up and give them a slightly toasty crunch. Who doesn’t want a delightful donkey piñata pattern on a tortilla warmer though? Boom, instant conversation starter! This looks absolutely delicious-can’t wait to make these! 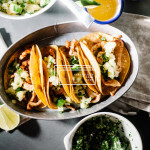 Are there any side dishes/ salads you’d recommend pairing with the tacos? I’ll be making this meal for some very hungry men! Thank you! Looks wonderful…what about a single burner hot plate at each end of the table. Then your guests can share in the experience and no one is stuck in the kitchen! These look perfect if I may say so. Utterly perfect. Wish I could attend one of your DIY dinner parties. This is beyond yum Stephanie! I love it! I’m with you on the tortilla problem. I will have to check out that warmer. These look delicious! I like the addition of fish sauce. Yum! I keep asking myself: why have I never made tacos before??? This looks amazing! I made these last night and they were a huge hit in my house! Quick, easy and extremely delicious. Thanks for the recipe I will definitely be picking up your cook book! The boy made this for my birthday dinner and it was a hit! Love your simple but flavour-packed recipes. The tortilla warmers are great. I have been using them for a few years. I have 2, one for each side of the table when we have company. My next “company dinner” will be the Caramelized Pork Tacos. I don’t see why you couldn’t blacken your tortillas ahead of time then heat them up in the warmer. I haven’t tried it but if you do just do a few to test. I have been using the microwave to warm tortillas for years. Works fine in the tortilla warmer; it works great for baked potatoes too. About 30 seconds for the tortillas and 8 minutes for the potatoes. I made this tonight and it was amazing and perfect! First time cooking with fish sauce, so now I’m not as scared by it! Thanks for the delicious recipe and beautiful blog.